So after I finished knitting the Tiny Chicken , I thought that hey what could be better to accompany it than a cute egg. Well, instead of a normal round shaped egg, why not a fried one? 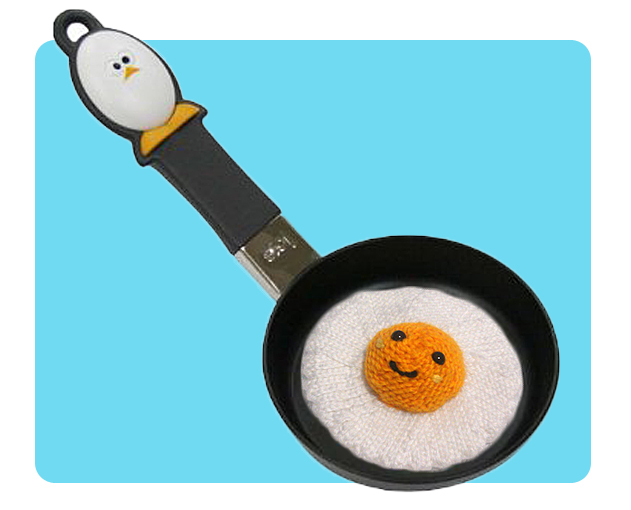 This is where this cute fried egg knitting pattern comes in. Designed by Ala & Ela, you can download the free pattern HERE. 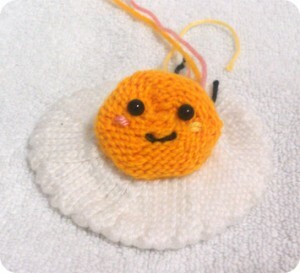 I don’t remember where I read it from, but apparently someone knitted this very same fried egg pattern in just 12 minutes! I cannot imagine how fast her/his hands has to move to knit it up so quickly! (Well I certainly for one took much longer than that). I found this pattern quite tricky yet very intricate — the egg white uses both M1 and Yo, both are different type of knit increase technique to produce interestingly beautiful pattern to the finished knit work. (DPN) double pointed needles, baby toys, cute amigurumi toys, face embroidery, free knitting patterns, intermediate knitting patterns, kid toys, knitted food, small stuffed toy. Bookmark.